Suddenly, a small purple butterfly on an almost invisible wire floats onto the stage from above. The chant stops as tiny gasps and whispers to Mom and Dad fill the room. The house lights come down and the show is about to begin. When you step inside the Puppet Art Theater on East Grand River Avenue in downtown Detroit you’re transported to a world of stringed whimsy that pulls inspiration from around the globe. Lining the brightly painted walls are hundreds of handmade puppets, some from as far as Italy and Nepal; one from China is over 100 years old. Some are small, able to fit in your hand, others larger than life, taller than the puppeteers who control them. Marionettes, rod puppets, and even the occasional finger puppet are all in attendance. 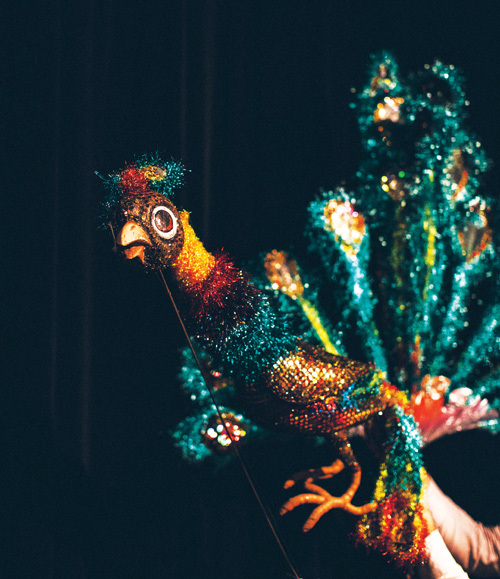 The theater is hidden in plain sight and is a piece of Detroit’s rich history in puppetry. 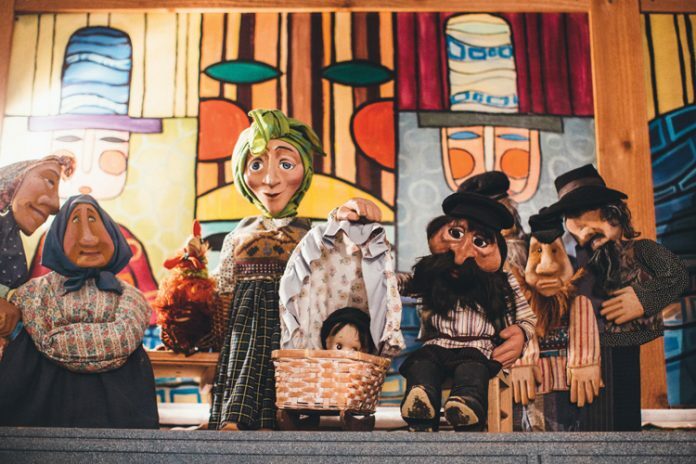 Few outside the immediate community know much about it, but for the last 18 years, Puppet Art Theater has put on thousands of original shows for children and adults alike. Beyond that, they have persevered and prospered in the face of economic challenges while educating audiences not only on puppetry but also of arts, culture, and puppetry performance abroad. Puppet Art’s story began in the fall of 1990 when founders Luda Mikheyenko, Irina Baranovskaya, and Igor Gozman met. 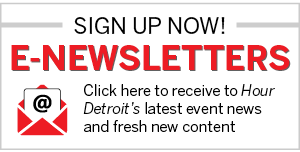 Mikheyenko, who immigrated to Detroit from Russia in 1982 and spoke no English at that point, posted an ad looking to meet other Russian immigrants in the arts. She first met Baranovskaya and Gozman in 1990, both puppeteers. â€‹Mikheyenko had worked in theaters in Russia, but never with puppets. “They seduced me to puppetry,” she says. Now, she prefers to work with puppets to live actors. “They can sometimes tell you more than an actor,” she explains. Actors are always actingâ€…—â€…puppets are their characters. In March of 1998, the trio signed the lease for their current location downtown, across from the J.L. Hudson building (which was in the midst of demolition). They began to familiarize themselves with Detroit’s history, and found they were most impressed by the city’s diversity. “We felt from that time, that we being Russian immigrants — being Jews from Russia … we fit that tapestry,” he says. Gozman explains this is what inspired the theater to not only represent their own culture through puppetry, but also to present a wide variety of cultures through the retelling of traditional folktales. location, then named the American Russian Theater, and opened with their first season by September that same year. For almost two decades, the team has produced more than 20 unique shows and performed for thousands, making themselves a cornerstone in Detroit’s puppetry community. In tune with their original aspiration, each production portrays a different culture. African, Latin, Russian, and other folktales are retold in ways that are educational as well as respectful of the culture. “We want to be very careful with tradition,” says Baranovskaya, who attempts to even replicate the traditional puppets. Each production is written with guidance from a cultural liaison, often college professors or anthropologists, explains Gozman. He wants them to be brutally honest, he says, as cultural stereotyping hits close to home. “To be Russian and speak English with an accent, when we watch American movies with Russian characters it’s always so silly,” he says with a laugh. Working with these cultural “tour guides,” as he calls them, prevents these silly mistakes and overall offensive representations. Even for less complex productions like Banana for Turtle, which is modeled for young children, elementary school teachers are brought in as a test audience, leading to acts that highlight subjects like vocabulary, proper manners, and basic math. 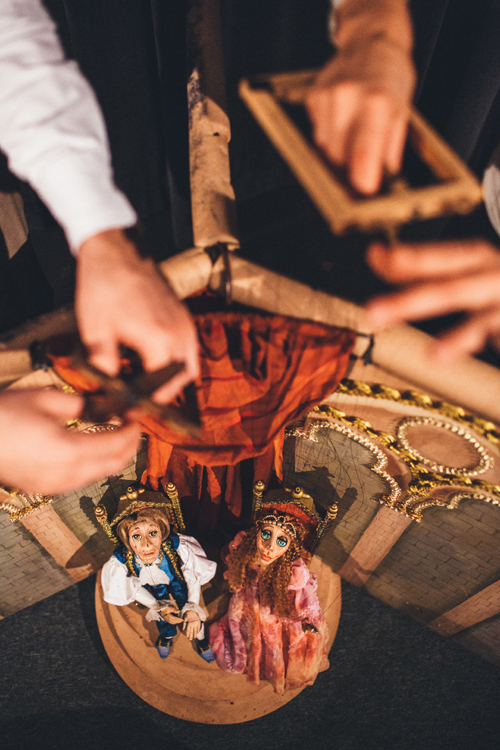 No matter the show, all of the puppets used in a Puppet Art production are handmade in the space’s workshop by Baranovskaya. Each one is unique and deeply detailed. Upon closer examination, they’re practical, made with available materials: old umbrellas, egg cartons, and foam. 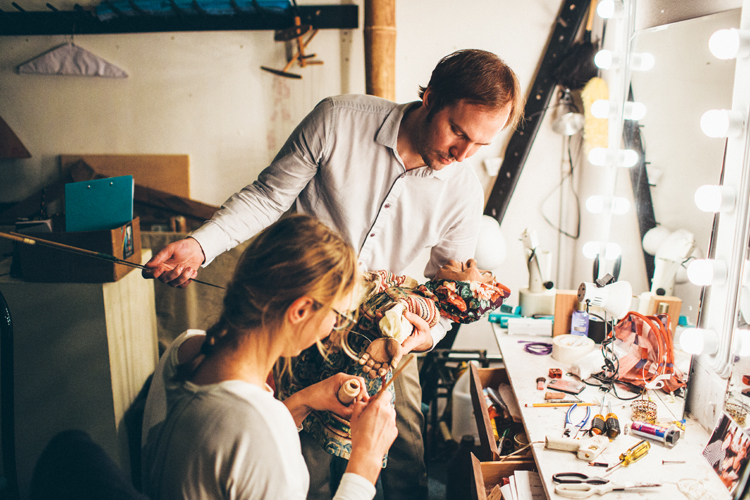 Puppeteers Nicholas Pobutsky and Jackie Strez fix a character. After performances, audience members can tour the workshop and see how the characters are made. Puppet Art also hosts classes where attendees can make puppets of their own. Baranovskaya has been making puppets for about 40 years and continues to refine her craft. “Every show you learn a lot,” she says. Some of her latest creations are for a French drama, The Visitor, a new production for the theater. The puppets are small with detailed, emotional faces. They’re in a sickly grayscale, adding to the aesthetic of the production. While a single puppeteer can control small puppets like these, for other productions mammoth characters require teamwork in tight places. For a previous production, Turtle Island, three puppeteers were needed to control the various moving parts on the main character — a turtle. The entire production, inspired by a Native American folktale, takes place on its back with moving mountains, crops, and a fire ascending from the shell. These types of large-scale productions can get pricey, and the nonprofit theater works on paper-thin margins. Puppet Art relies entirely on grants and donations. They are often asked how they have survived for so long in Detroit, and to that, they all have the same answer: They don’t give up easily. “Don’t forget that we came from Russia,” says Mikheyenko with a laugh. Beyond the shows, the space serves as a museum, a common addition in Russian puppet theaters, explains Gozman. Among the original characters are donated puppets from around the globe and even historical pieces from Detroit. Well before the days of Sesame Street, a local puppet gained fame in 1947 when Detroit Puppeteers Guild founder Ed Johnson began producing the Let’s See Willy Dooit show, one of the first Detroit television shows geared toward children. 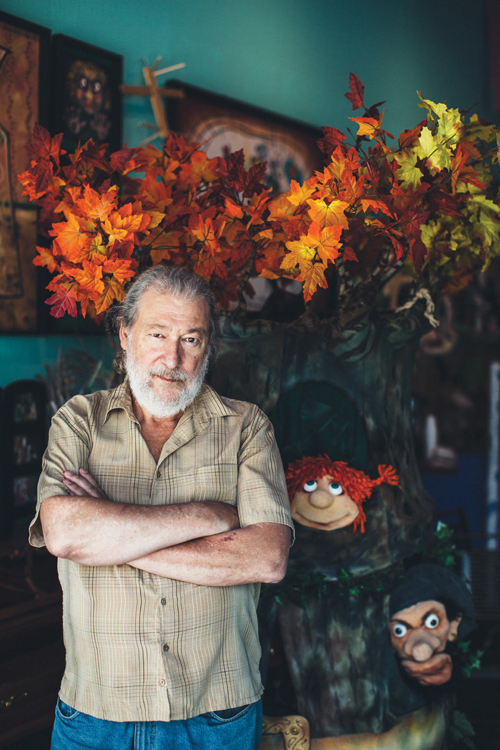 Although Puppet Art has become a highly revered institution, they aren’t done growing yet. This sort of growth requires funding. Puppet Art is thankful for their support from the community and organizations like the Michigan Council for Arts and Cultural Affairs, Kresge, and Quicken Loans. But further support is needed to ascend to the next phase. In the meantime, Puppet Art will continue to beat all odds. Not only have they prospered in the face of economic hardship well before the current renaissance, but they’ve also brought Detroit an art form that is seldom seen in major U.S. cities.